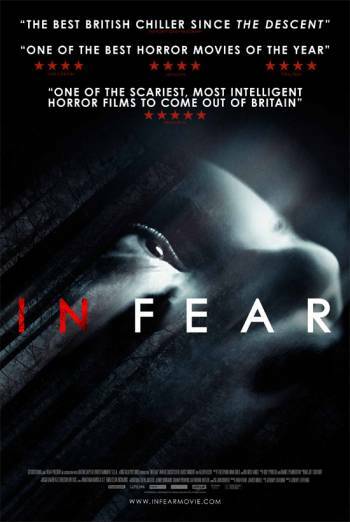 IN FEAR is a thriller about a young couple who become lost and are pursued by a stranger. It is rated 15 for strong violence, threat and language. There are some jump moments and scenes in which people are threatened. There are also scenes of violence, including a bottle being smashed over a man's head, some heavy kicks, and a wrist being broken. There is some sight of bloody injuries. The film includes around 30 uses of strong language ('f**k'). In one scene, a character sees a plastic tube running from a car's exhaust pipe into the car. When the trunk is opened, a man is seen inside with the pipe attached to his mouth.